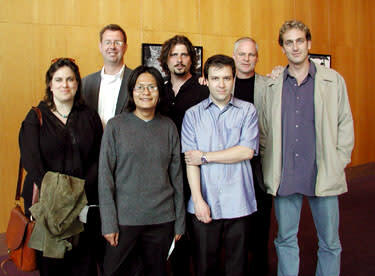 Pictured from left to right: Annie Reid (Revival), David Thompson (Still Life - The Humanity of Anatomy), Bennie Klain (Yada, Yada), Brett A. Hart (Dead End), Marc Pilvinsky (Indefinitely), Andrew Garrison (Maxine), Jason LaMotte (Post Modern Man). A man running away from his problems discovers that being alone can be the worst problem of all. Brett Hart began making films in the sixth grade and has continued to hone his skills in the suspense genre. Under the tutelage of professionals such as director Richard Franklin and cinematographer Victor Duncan, Hart made award winning student films that caught the attention of Opticon Entertainment who hired him to direct karaoke music videos. Hart parlayed this into directing commercials for several companies around the country, including commercials for regional Toyota and Texas Ford. In addition to currently directing commercials and music videos, Hart ( www.brettahart.com ) is developing several feature film projects, most notably Bone Dry. A wedding videographer decides it&apos;s his moral obligation to break up the bride and groom. Chaos ensues. Marc is a filmmaker from Athens, GA, Dallas, TX and now Santa Monica, California. He has produced numerous short films and music videos in addition to the digital feature film Hall of Mirrors. His script for the feature Indefinitely is his third completed, following on the heels of Dark Matters (a tension-filled, brutal horror film set in the vast darkness of West Texas), and Burn For You (a drama that exists in the dark suburban landscape between Blue Velvet and Vertigo). In a major change of pace, Indefinitely (www.indefinitelymovie.com) is a romantic comedy. Maxine, a 37-year-old single mother, has just returned to Kentucky, angry and exhausted, after failing to rescue her daughter from a doomed marriage. She gets a lift home from the bus stop from friend and neighbor, 23-year-old Wilgus Collier. Maxine has long-fueled Wilgus&apos; adolescent fantasies but now he is about to leave for graduate school. The two friends are suddenly, potentially, more than just friends. This is the third story of the one-hour trilogy, The Wilgus Stories, starring Ned Beatty. Andrew Garrison began making films as a documentary maker. He is a recipient of the trifecta of independent film fellowships, an AFI fellowship, an NEA Fellowship, and a Guggenheim. They still charge him $4.00 for a latte in Starbucks. The Post Modern Man is a stylized visual interpretation of a poem by the same name. Jason LaMotte studied theater for two years under Pulitzer Prize-winning playwright Edward Albee, who produced LaMotte&apos;s play The Magic Hour in 1997 in Houston. In the last four years Jason successfully segued into the film industry working in varying production capacities on corporate, music video, and commercial film shoots, most recently as a producer and director. Jason currently resides in Los Angeles where he is directing commercials. In small town Texas, Ruth saves a drowning man from a terrible accident and is transformed from a nobody into a hero - for one short night. It&apos;s not long before the judgment of the town comes down on Ruth and her notorious mother Charlotte: Ruth may have done the right thing, but she saved the wrong man. A native of India, director Meghna Haldar came to the United States in 1998 to study film at University of Texas at Austin. For her, filmmaking is primarily a tool by which she can explore the worlds of displacement, alienation and identities through story. Meghna is working on her first novel and is looking to make the multiple award-winning short film Revival into her feature length directorial debut. Meghna will be teaching undergraduate film editing this summer at the University of Texas at Austin. Annie Reid, writer/producer, teaches fiction writing at the University of Texas Extension in Austin. Her stories have appeared in journals such as Alaska Quarterly Review, American Short Fiction, and Nimrod, and in the anthology Good to Go. Her short stage works have been performed at several stages, including the Seattle Art Museum and Austin&apos;s Fronterafest. She&apos;s written and produced two short films and has recently completed a feature-length draft of Revival. Still Life-The Humanity of Anatomy is a humanist exploration of the unstated but powerful relationship between medical student dissectors and their cadavers. It is a conversation crafted from interviews with gross anatomy students, faculty, and a donor to the Willed Body Program at the University of Texas Medical Branch. These diverse voices are connected by stirring scenes from an annual voyage into the Gulf of Mexico to scatter the ashes of unclaimed cadavers. ttweak is Randy Twaddle, David Thompson and Chris Nelson who are each award-winning professionals in the fields of visual arts, music production, and documentary video. Twaddle, a National Endowment for the Arts Fellowship recipient, has worked as an exhibiting visual artist for over 19 years and is represented in museum collections across the country. Thompson, degreed in music from Rice University, has 15 years professional musical performance experience and 16 years experience in multi-genre production with clients such as ABC, BMG Entertainment/NYC and FOX Network. Nelson, a graduate of the Plan II Liberal Arts Honors College at the University of Texas, Austin, has edited episodic TV and national/regional spots since 1993 and cut the national Addy award-winning PSA campaign Stop Child Abuse Before it Grows Up. ttweak ( www.ttweak.com ) continues to create award-winning videos for various corporations and arts institutions. Yada Yada examines racial attitudes and differences within the American landscape. This compelling short film portrays a moment of historic reality with regard to the Native American experience and contrasts it with history in the making on September 11, 2002. Bennie Klain, writer/producer/director, has had two short films as Official Sundance Film Festival selections. His first was in 2000 as co-producer of the acclaimed documentary The Return of Navajo Boy (www.navajoboy.com) and again in 2002 with Yada Yada. KlainÕs career began as program director for public radio station, KGHR-FM in Tuba City, Arizona where he first gained recognition for producing the nationally syndicated Native American music program Windsongs. He then moved to the commercial radio station KTNN, which is licensed to the Navajo Nation, where he became an award-winning journalist anchoring three Navajo language newscasts a day. Klain currently resides in Austin, Texas, and is an undergraduate in the Department of Radio-Television-Film at the University of Texas at Austin.